Imagine about a luxurious lifestyle in the advanced Noida city where all your dreams come alive and you can rest assured for lifetime and living closer to the modern facilities, comforts, and amenities. Well, this is not an imagination anymore and is quite gettable and well in your reach as the wonderful residential project, Mahagun Meadows has brought its tremendous range of ultra-modern apartments where you can experience the same kind of lifestyle. The beautifully appointed apartments in this township come with a scenic view of magnificent garden areas and unique water elements. Inspired by the Roman architecture, the development has planned very thoughtfully to provide you with the best quality of living spaces. The luxury homes are available here in 2 BHK + study room, 3 and 4 BHK configurations varying in sizes from 1425 sq. ft. to 5000 sq. ft. and buyers can also choose here from the 28 signature villas. Meadows are one of the most sought-after developers in India and with their tagline, “A Name That Perform”, they have meant it gracefully here. The level of this project is quite high and one can feel here safe, secure and comfortable. Homes in Mahagun Meadows Noida include sophisticated interiors and their glorious specifications contain soaring ceilings, oversized windows with glass frames, a stylish kitchen with cabinets and other useful modern appliances and provisions, a stunning glass tile backsplash, plush carpet, vinyl wood-plank flooring, comfortable bedroom, spacious balconies with magnificent views of garden areas, living and dining rooms, study room, western style toilets, premium sanitary wares in the washrooms etc. After choosing this development, you will be minutes away from shopping, restaurants, entertainment, nightlife, and several public and social facilities. There are plenty of renowned schools, hospitals, leading banks, ATMs, marketplaces around Mahagun Meadows Villas. The property is very easily accessible from all the major sources of transportation in the National Capital Region. 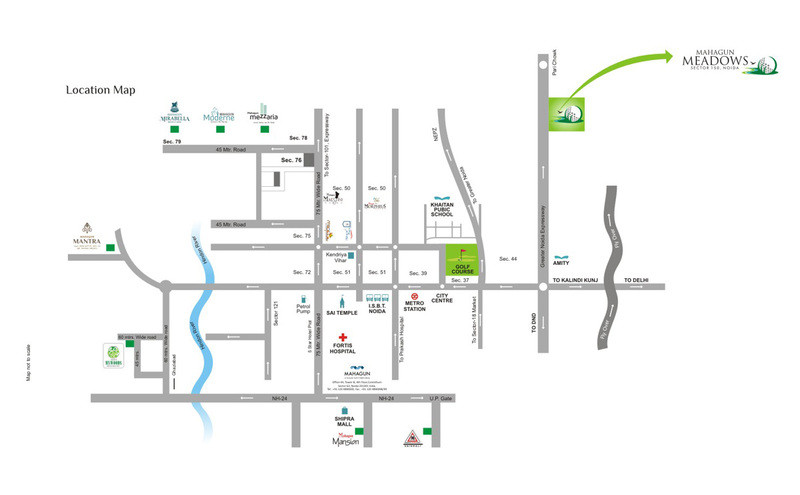 The development is a part of the prestigious sports city located at Sector 150, Noida. It is located very close to the expressway and therefore, residents here can move around easily to anywhere in the NCR in quicker time. Once can fill his social calendar here and can plan monthly events here at this preferred living community. One can enjoy here the pool parties, holiday parties, sports events and much more. To keep you fit and stay healthy, there is a fitness club in the township and there are yoga, meditation, and aerobics centers. The gated community provides round-the-clock security to the users with CCTV monitoring and there is a provision of power backup here with 24-hour running water. Make-up your mind soon and request for the Mahagun Meadows Price List at booking counter to get an apartment or villa here. Pitch and Putt Golf Course. Panoramic view from Master Bedrooms. Located at Sector-150, Expressway, Noida. 20 kms. From Sector- 18 Noida.